Abstract: This article explains how data can be exported to files (all imported from files) in software from RP Photonics. Certain script commands and functions give you the uttermost flexibility. I am often asked whether or how one could export data from our software in order to process them further in other software like MatLab or Origin. Therefore, I now devote an article to that topic. Do You Really Want to Export the Data? You want to combine several pieces of data in one diagram. You want to add further features to a diagram (e.g. various labels, additional plots, etc.). You want to change the style of the diagram, with modified details like font types and font sizes. You want to generate graphics with higher resolution, e.g. use in a print publication. Why are these bad reasons? Simply because it is normally more convenient to do such things directly in our software – avoiding the hassle of exporting the data, starting some other software, importing their – and doing everything from start when your calculation run has to be done again. Here, I don't want to discuss the details of how to do the mentioned things in our software, but you can have a look at the documentation or ask me within the technical support. The data are needed by a colleague who does not have our software. Modify the number of displayed valid digits, or set a fixed number of digits after the floating point. Use a tab character (char(9)) instead of a comma as the separator. Rescale the data in any way, e.g. convert them to other units. Exchange the columns or add another column, which shows e.g. a quantity calculated from x and y. After changing the formatting expressions, just press the “Reformat” button, and the displayed results will be recalculated accordingly. You can then copy the data to the Windows clipboard or save the data to a file. If you already have our software and want that feature (which is now offered by all our programs except for RP Fiber Calculator), just tell us, and you will get a free update. 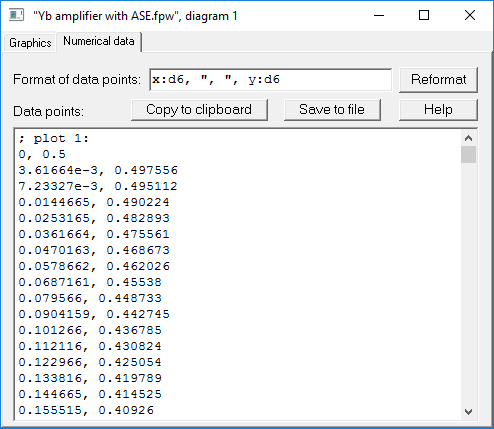 The x values of the data points are generally not equidistant: you get exactly those points which were calculated for the plot, and the choice of x positions is done by the plotting algorithm with automatic step size control. You may want to export some data without plotting them. You may want to generate multiple files automatically (i.e., without further manual operations). FileName$ := "pump and signal vs position.txt"
Obviously, that way you have full control over details like the step size of the data points, the rounding of values, separator characters, etc. Note that you can use such commands even when working with interactive forms in RP Fiber Power: the forms contain fields where you can enter some script code. You can enjoy an even greater flexibility by using certain functions in expressions rather than commands. These specialized functions are useful for data output to files; you can even export or import binary data. The difference between functions and commands is that a function can be called within any mathematical or string expression; such an expression can be contained in a script command. You can then also profit from the even substantially more powerful control structures as offered by our mathematical engine. You see that such features really give you an enormous flexibility. You can generate text files and binary files of any format. Of course, you could write any sequence of numerical or string data into a binary file; also, you can choose between single precision and double precision data. Similarly as shown above, you could import the most complex types of files, if you only know the file format to expect. It would be no problem, for example, to read from such a file first how many data points will follow, then read the appropriate number of points, and finally compute the minimum, maximum, average and r.m.s. value from the results. You thus see that you might even want to use our software for processing data from other sources – even if they do not relate to physics simulations. There should be no need to have something like MatLab in addition for such purposes.